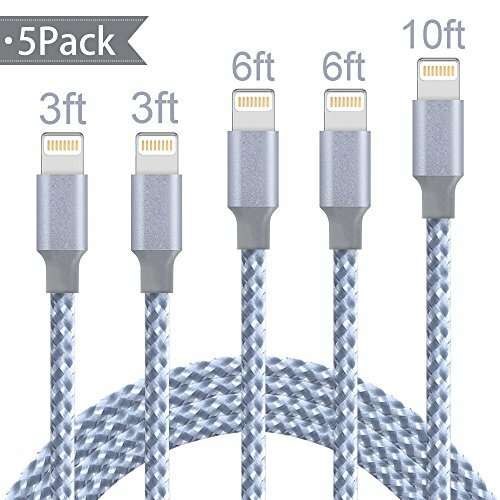 [5Pack 3FT 3FT 6FT 6FT 10FT Standard Long Cable] 3FT 3FT 6FT 6FT 10FT cable is most frequently used length for fast charging speed. Pay less to get more. Great performance: Great performance ensures your devices syncs and charge simultaneously with up to 480 mb/s transferring speed.Great performance ensures your devices syncs and charge simultaneously with up to 500 mb/s transferring speed. Compatible with: Compatible with iPhone X/8 plus/8/7/7 plus, 6/6s/6 plus/6s plus, 5/5s/5c/se, iPad, iPod Nano 27, iPod touch.